Have you completed your graduation in B.Com and now looking for employment? Regardless of your level of expertise now you can get the B.Com Pass Jobs and the Jobs for B.Com Freshers all at one place. The rise in the commercialization is on its peak. 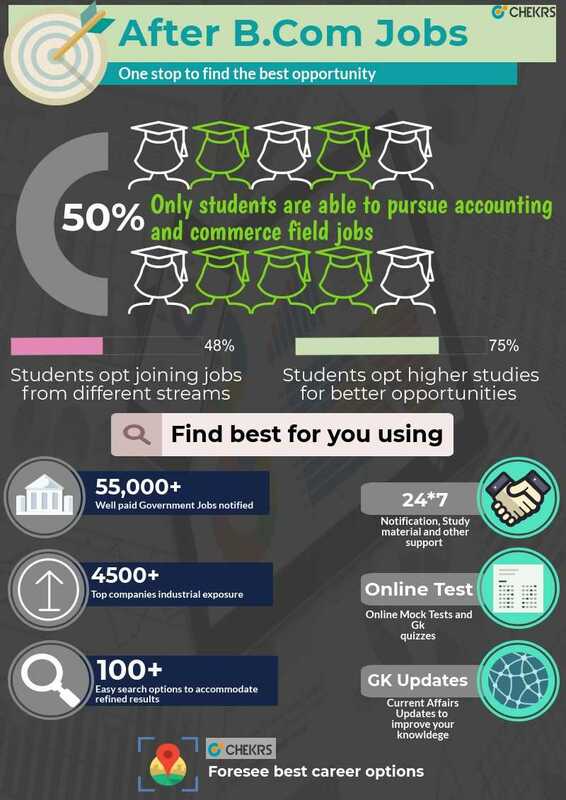 Hence the B.Com graduates have the all time scope to find their dream job as per their location preference such as the B.Com Jobs in Pune, Mumbai, Bangalore, Hyderabad, etc. Not only this if you are well versed with the sound knowledge of the accounting, data handling, customer relation even the private sector jobs can give you a promising future. You can even get the chance for Jobs for B.Com Freshers in TCS, Jobs for B.Com Freshers in Infosys, Jobs for B.Com Freshers in Infopark, etc MNC Companies. You can easily receive the instate updates of Latest Jobs for B.Com Graduate and also the Recent Govt Jobs for B.Com Graduates by allowing jobs.chekrs.com to push notifications to you every day. Why follow Chekrs for Latest B.Com Vacancy? Not just the vacancy updates are important but beating the competition and acquiring a reputed position is equal for all. To help you succeed we provide complete the details of notification in terms of profile requirement, its eligibility, selection process and how you can apply for them. To make sure you give your best the study material is also provided comprising of papers and online tests.